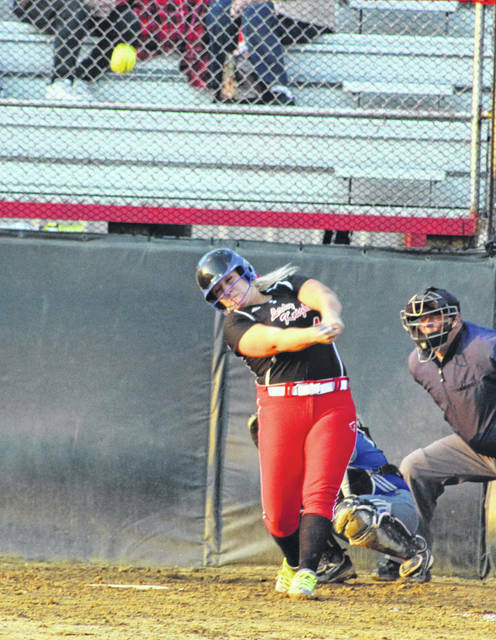 Point Pleasant senior Kelsey Price hits a fly ball during Wednesday night’s non-conference softball contest against Ripley in Point Pleasant, W.Va.
POINT PLEASANT, W.Va. — They made the most of their evening. 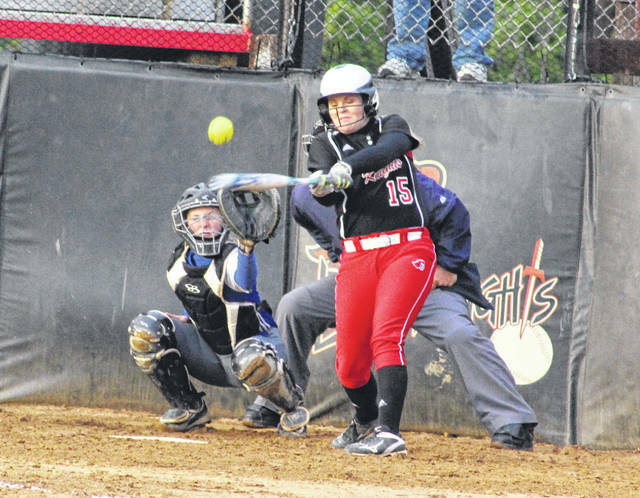 Senior Kelsey Price knocked in classmate Kelsie Byus with a sacrifice fly in the bottom of the seventh, allowing the Point Pleasant softball team to celebrate Senior Night in walk-off style Wednesday night during a 4-3 victory over visiting Ripley in a non-conference contest in Mason County. The Lady Knights (14-5) honored six seniors — Price, Byus, Leah Cochran, Rachael Grimm, Kenzie Roush and Lila Beattie — before the game, then a majority of those upperclassmen spent the rest of the evening making significant contributions against the Lady Vikings. The hosts never trailed in the contest, but RHS ultimately never went away after tying the game at two through three innings and again at three-all after six complete. The Red and Black, however, managed to put things away in the home half of the seventh after a leadoff single and an error allowed Byus to reach third base safely. Ripley followed by issuing back-to-back intentional walks to 3- and 4-hole hitters Tanner King and Cochran to load the bases for a force at any base. Price came to the plate with nobody out and ultimately lifted a 1-1 offering out to deep centerfield, which proved to be the only out in the frame. Byus tagged and came in with the eventual game-winning run, giving the hosts a 4-3 victory. It was the fifth time this season that the Lady Knights won in their final at-bat, all of which ended up by one-run margins. Point Pleasant is also 6-2 in one-run contests this spring. Afterwards, PPHS coach James Higginbotham noted that Ripley put together a quality effort overall — but one extra mistake opened the door for the Lady Knights in that final frame. And, as you’d expect from experienced upperclassmen, the Red and Black took full advantage of the situation. “We had one error and they had two, and that second error saved us from having to bunt Kelcie (Byus) up a base. That really helped us there in that situation and we were able to take advantage of it,” Higginbotham said. “These girls, they never think that they are out of it. It would be nice to get out in front every once in a while and stay out in front, but we just keep finding ways to respond the deeper games go. The Lady Knights built a 2-0 lead in the bottom of the first as Cochran received a bases-loaded walk that plated Peyton Jordan, then Byus came in one batter later on a Price ground out — making it a 2-0 contest. The score remained that way until the top of the third when Cassidy Young belted a two-run homer to centerfield. Paige Swisher also scored on the two-out blast that knotted things up at two-all midway through the third inning. Point Pleasant recaptured the lead in the fifth as Cochran belted a solo shot deep over the left-field fence, making it a 3-2 contest. The Lady Vikings, however, rallied to tie things up in the top of the sixth as Taylor Johnson hit a bloop single into shallow right field, allowing Katie Sinclair to come home with one away for a three-all contest. PPHS outhit the guests by a 7-3 overall margin and also committed only one of the three errors in the game. The hosts stranded nine runners on base, while Ripley left five on the bags. Cochran was the winning pitcher of record after allowing three earned runs, three hits and seven walks over seven innings while striking out six. Jaelyn Hunt took the loss after surrendering four earned runs, seven hits and six walks over 6⅓ frames while fanning four. Byus and Cochran led the Lady Knights with two hits apiece, followed by Jordan, Beattie and Hannah Smith with a safety apiece. Cochran and Price both drove in two RBIs each, while Byus scored a team-high two runs. 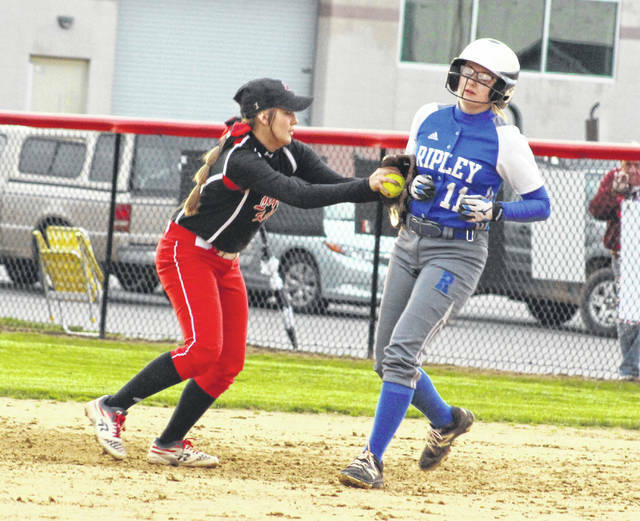 Young, Sinclair and Johnson had the lone hits for Ripley, with Young leading the guests with two RBIs. Point Pleasant completes its regular season schedule on the road as it travels to Winfield Thursday and then goes to Huntington on Friday.